Since 1987, Bay Screens and Shades has made a substantial investment in developing motor controls, switches, and accessories adding a high degree of functionality, flexibility, and value for your clients motorized shades. Working with all our vendors we have developed a variety of systems and solutions, which can interface with all lighting, A/V, and building management control systems. The options vary from simple switches to the most sophisticated, user-friendly software-based systems as well as advanced home automation which you can see below. 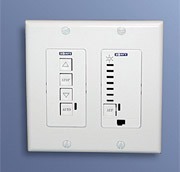 Engraved Wireless Wall Switch: Switch operation allows individual control for convenience of each office occupant or group control for operating all shades per exposure or building zone. Three position switches (up/center off/down). 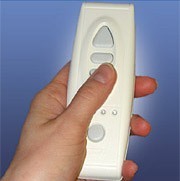 We now has the ability to custom engrave the DecoFlex WireFree RTS wall switch buttons for additional personalization. The engraving options for the DecoFlex WireFreeRTS includes a nine character maximum for the top six buttons and a five character maximum for the bottom two command buttons. To further customize their switch, customers can choose their preferred character type, such as all capitalized, first letter capitalized or custom. Remote Control Operation: Remote control operation simplifies electrical wiring as it eleminates the need to run switch legs. Shades can be operated individually or in groups. Special Built-in radio remote control motors simplify wiring. The motors can be plugged into an outlet located near the head of the window. remote switching provided by Hand-held Remote Control Transmitters, Wireless Wall-Mounted Switches, or Wireless wall-Mounted Timers. Automatic Control Operation: Automatic controls maximizes the performance of shading products. The Sun controller greatly increases energy performance as shades are automatically rolled down when direct sunlight is overheating the building. The timer assures consistent building apprearance as shades can be timed to open and close together. Sun Controller can operate a single shade or all of the shades in a gorup. Adjustable light level intesity lowers shades only when there is too much sun. Twenty-four Hour timer operates shades at present times each day. Building Automation System Operation: Lighting and Home Automation control allows shades to be operated in concert with lighting, security, heating and air conditioning, or audio visua system controls. We offer 3 methods to interface any brand of controls with motorized shades and window treatment solutions.Programmable motor controllers with bus line communications can be linked in any configuration and receive inputs via: Dry Contact, RS232, Infared Emitter, Internet Protocol System.